Nippon Steel & Sumitomo Metal Corporation (NSSMC) is one of the world's leading steel producers, and it has a long history in Japan. The company’s high quality iron and steel products are used in a broad range of industries, including automobiles, rail transport, machine tools, and construction. 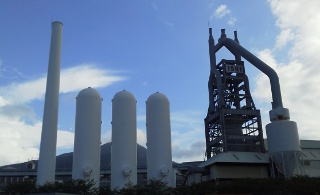 NSSMC's Yawata Steel Works is located in Fukuoka Prefecture and dates back to 1901. It was the first steel works in Japan, and is registered as a World Heritage Site. The No. 3 steel mill at the Yawata Steel Works has four continuous casters (strands) that produce slabs and blooms used to make high-grade steel sheets for automobiles, electrical steel sheets, and steel bars. 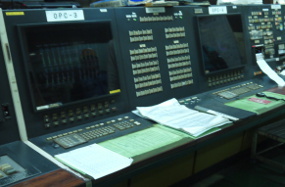 Yokogawa CENTUM series distributed control systems (DCS) have been used to control the continuous casters at this plant ever since they were first introduced in 1979. Japan's steel industry was devastated during the Second World War. After the war, plants were reconstructed using machinery and technologies imported from the West. Throughout the 1960s and continuing on into the 1970s, industries grew rapidly in Japan, and a number of large integrated steelworks were built to support the construction of expressways, Shinkansen (bullet train) tracks, buildings, and other infrastructure. The steel industry supported the rapid development of other industries as well, including the petrochemical and chemical industries, and Japan eventually became the world’s number three producer of crude steel, after the Soviet Union and the United States. During this era, a number of steel mills around Japan improved efficiency by introducing continuous casters and making early use of instrumentation and process control equipment, and it is said that this helped to spur the development of these technologies in Japan. When the phase of rapid economic growth came to an end in the mid-1970s, Japanese steel plants shifted to the production of the high-quality and high value-added steel products that they are known for today, and the operational know-how and technologies that they had acquired were put to use in blast furnaces, basic oxygen furnaces, continuous casters, hot and cold strip mills, and other major plant facilities. In line with efforts that were being made to improve production yields in this industry, two new slab continuous casters (the No. 1 and No. 2 strands) were built at the Yawata Steel Works' No. 3 steel mill, and these started operation in 1979. Two new continuous slab and boom casters (the No. 3 and No. 4 strands) were added in 1982. First generation CENTUM DCSs were installed on each of these strands, and the DCS on the No. 4 strand remained in operation for a total of 33 years, until April 2015. In the 1950s, processes were controlled with analog field instruments. 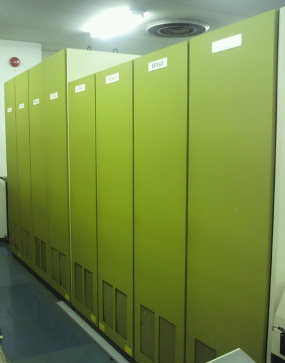 When the first compact electronic panel instruments appeared in the 1960s, plants began to establish central control rooms and to consolidate there the various instruments that had previously been located near individual facilities. From this point onward, remote process control became the norm. 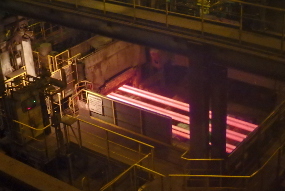 Various types of sensors for the measurement of temperature, level, flow rate, and pressure were also being developed to acquire data that could be used to ensure the stable production of high quality steel products in processes where temperatures could reach as high as 1,500 degrees Celsius. As additional control loops were built and the number of I/O points multiplied, it became more difficult for human operators to configure and monitor them. With the evolution of computer technology in the 1960s, digital direct control (DDC) was introduced and soon was widely adopted for the control of processes in industrial plants. A single DDC computer could perform the work of 100 - 200 analog controllers. In 1965, Yokogawa introduced the YODIC 500, its first DDC, for use in a wide variety of industries, including the steel industry. The company also continued to work on innovations such as redundancy that helped it improve its control systems. In June 1975, Yokogawa introduced CENTUM, the world's first distributed control system. 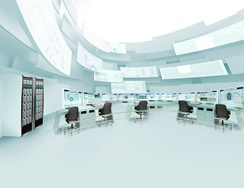 Why the need for a distributed control solution? The DDC is a single computer that centralizes the control of hundreds of control loops. In addition to having drawbacks such as decreased response times, such a system can be difficult to maintain and expand. A particular weakness is that the entire system can be brought down by a single failure. To address such issues, Yokogawa came up with a new and innovative concept that involves the distribution of the control components and the centralization of the management of data. "When a DDC fails, all ability to control a process can be lost. This is something to be avoided at all costs, so we began looking for ways to avoid system shutdowns when failures occur. For large plants where different production facilities are scattered over a wide area, we began to think that the process control system should also be distributed. We started work on creating a new concept for process control systems that was based on geographic distribution, functional distribution, and risk distribution. The development team often talked late into the night about their concept for a new type of control system. It took about a year to finalize thinking on a system where control would be distributed and data management would be centralized using a network. This effort was being spurred on by digitization and advances in microprocessor technology, and the concept that we came up with then provided the foundation for our current DCS architecture. The transformation from control panels equipped with panel instruments to centralized control using CRT displays is one of the innovations that were achieved with the CENTUM system. Having said that, it was really difficult to get our customers to make the switch to CRTs. To make it easier for them, we tried to design the CENTUM screens and keyboards so that they more closely resembled the control panels. For example, CENTUM faceplates were designed to resemble panel instruments. We also decided to use terms for items such as the instrument types that were familiar to operators, and developed engineering functions that did not require the use of difficult programing languages. Some of our customers actually installed both the CENTUM operator consoles and the traditional control panels, which they usually hid behind a curtain, thinking that their operators would prefer in an emergency to use the interface that they were most familiar with. I think it took some courage for our customers to make the switch to a new technology like CENTUM. The time was absolutely right for a solution like the DCS. Many of our customers acknowledged the value of this system and introduced it. Although unexpected problems did occur early on with the use of this new technology, our customers worked with us to find solutions. They trusted that we would be able to deliver the benefits that were expected with CENTUM. I'm truly grateful for the confidence they showed in us." 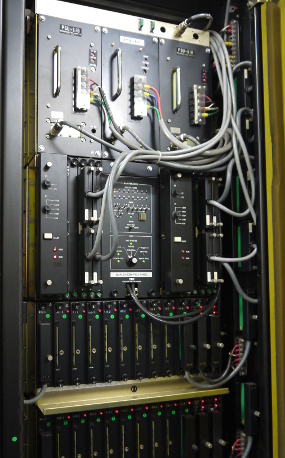 Field control stations (FCSs) with dual redundant CPU modules were installed on the No. 3 and No. 4 strands at the Yawata Steel Works. With the development of the YODIC DDC, Yokogawa had already started working on redundancy technology. In the process industry, plant shutdowns can lead to enormous losses for a company, and must be avoided at all costs. In response to this need, Yokogawa developed a backup arithmetic control unit for the YODIC system in 1967. In 1970, the company went on to develop similar backups for this system’s CPU module, main memory unit, I/O modules, and other components. This pursuit of redundancy continued with CENTUM. In 1980, we introduced with the CENTUM FCS the use of dual redundant CPU modules, each of which was equipped with a pair of independently operating microprocessors. The CENTUM system installed at the Yawata Steel Works was among the first to employ this technology. For increased stability in plant operations, Yokogawa had developed other technologies as well. For instance, a V net control bus was developed that employs the so-called “baton-pass” method. With this method, even if an FCS fails, communications will not be disrupted. Later, dual redundancy was also introduced with the V net network. Through such efforts, Yokogawa’s research and development staff have continually striven to make improvements that will improve reliability and eliminate plant shutdowns. Steel mills are very large, and the safe and stable production of high quality iron and steel products often requires extremely delicate control and detailed real-time access to process information. In the early days of working with computerized control systems, engineers went through a great deal of trial and error as they tried to reproduce the rich knowhow of experienced operators. "To get good quality products, the most important thing with the continuous casters is the mold level control to make sure that the same exact amount of molten steel is poured into the mold each time, staying within 10 millimeters of the specified level. At the time, we had a poor know-how of DCS PID control, and the operational accuracy of actuators was very low. Of course, the sensors in use back then were not as accurate. Through trial and error, I worked with the customer to calculate the right PID parameters. Control of the secondary cooling process was just as important. I learned a lot about how to control the flow rate for the spraying of water onto the slabs to prevent abnormalities and improve production efficiency." The steel rails produced from the blooms cast on the No. 4 strand are used on Shinkansen (bullet train) rail lines, and must meet exact specifications for size and durability. The rails manufactured at this plant have high resistance to wear and internal fatigue, and are well suited for heavy-load applications in markets such as North America. How could a control system remain in use for such a long time? The CENTUM system on the No. 4 strand remained in use for a total of 33 years, and no major problems were reported during this period despite in the conductive dusty steel mill. It helped that the CENTUM system was carefully installed at a location far from the plant floor and that the temperature in this room was kept at 18 degrees Celsius year-round. The system was also frequently serviced by Yokogawa engineers. "The CENTUM system kept working, so we kept using it. A few times the operating CPU automatically switched over to the backup CPU without us even noticing it, and thanks to the dual redundant system architecture this never led to a sudden system shutdown. The operator console also broke down a few times over those 33 years, but this never had a big impact on the plant operations. Oh, and in recent years there were some problems with the 8 inch floppy disk drive and the modem that had to be fixed." "I was in charge of everything from starting up the system to PID tuning and maintenance, so I was easily able to pinpoint the problem cause whenever the customer contacted me, and I could usually complete all repairs within an hour. Even after I was transferred to another service office, Mr. Sato kept asking me to come and repair the CENTUM. Now that is just another good memory. That CENTUM system was like my child. Now that it has been upgraded to CENTUM VP, I feel a bit sad, but I also feel relieved." As technologies continued to develop, work to expand and improve the capabilities of the CENTUM system on the No. 4 strand was carried out from time to time, and the changes that were made helped to reduce workload and improve the overall efficiency of operations. The first generation CENTUM system had just 32 kilobytes of RAM and no hard disk. A number of Yokogawa sub-systems were installed such as PROSAT for auto start control, Micro-XL for mold level stopper control, astnex for argon flow control, and CENTUM CS 3000 for sliding nozzle control. As a result, the control system became increasingly complex. After the CENTUM system on the No. 3 strand was upgraded to CENTUM CS 3000 in 2007, the sole remaining first-generation CENTUM system at this plant was the one on the No. 4 strand. Finally, this first generation system was upgraded to CENTUM VP in April 2015. The complex sub-system functions were all integrated into CENTUM VP and a STARDOM process automation controller. The new system is also connected to a Yaskawa electrical control system to form an integrated electrical & instrumentation (E&I) system. This system continues to play a key role in ensuring the production of high quality steel on the No. 4 strand. Today, Japan's steel industry is world class, and its companies have developed steel making technologies and engineering capabilities that are in a class of their own. Over the past 40 years, the monitoring and control technologies of Yokogawa’s CENTUM series DCSs have continued to evolve, and it is thanks to customers such as NSSMC that Yokogawa has been able to continue innovating and accomplish so much over this long period of time. 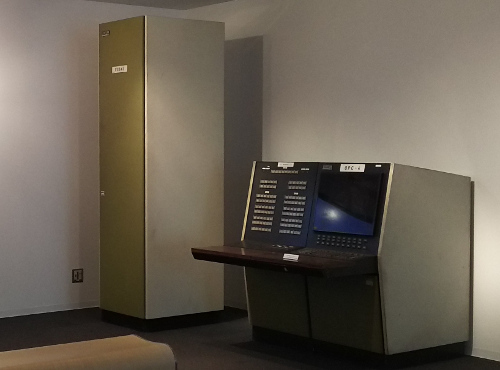 As a symbol of Yokogawa’s long efforts to co-innovate with its customers, the CENTUM system that was retired after 33 years of use is now on display in the showroom at Yokogawa headquarters. - How are things now that you have upgraded to the new CENTUM VP system? "I was relieved when the system upgrade was successfully completed. Frankly speaking, I was always wondering whether the old system would be able to start up again in the event of a power outage. That system had to be booted up using a floppy disk, and I frequently used to ask Mr. Ikeda to make backups of those disks. I guess a lot of people these days have never even heard of 8 inch floppy disks!" - With such a complex system, was it difficult to upgrade to CENTUM VP? "We gained valuable experience in 2007 with the replacement of the CENTUM system on the No. 3 strand. That was a very hard task. There were almost 30 documents that had been made for each expansion project and they all had the same title: Final Drawing Document. We asked Yokogawa to sort and summarize those documents and to make a proposal on the requirements for replacing the system. Thanks to this experience and the insights that were gained, the system replacement for the No. 4 strand was not as difficult." - After using CENTUM VP, what are your impressions of it? "We’ve had no problems with it. Before upgrading the No. 4 strand’s first generation CENTUM system to CENTUM VP, we had been using CENTUM CS and CENTUM CS 3000 on the other strands, so we were already familiar with the operation of the newer CENTUM series systems." "Compared to the old CENTUM system, it has improved functions, and this has helped us enhance the secondary water-cooling process. I still think that there is much room for improvement with the FCS controls. Of course, the human interface stations (HIS) display much more data, and the graphics are improved." "As the hardware is becoming more commoditized, it would not be realistic to expect this control system to remain operational for another 33 years, but I do expect that it will have a long lifecycle." - Have you considered replacing this with another vendor’s DCS or PLC? "Of course, as part of our update planning, we did a comparative study that looked at that possibility. Maintaining consistency was important, however, and we selected CENTUM VP because our other strands all use CENTUM series DCSs and our operators are all familiar with their operation. This is important for the safety of plant operations. And the HIS keyboard with keys for simultaneously operating up to 8 loops is very useful!" "I don’t think that other vendors will ever be able to compete with CENTUM VP’s dual redundant technology. When the filling of a mold must be controlled with 100 millisecond accuracy, I would be quite concerned if it took a whole second to switch between CPUs. Mold level control not only affects product quality, but also has a great impact on plant safety." 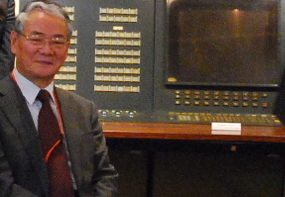 "My impression is that Yokogawa's redundancy technology is the most reliable. The pair & spare method, which in effect is redundancy squared, is very reliable."